In addition to refreshing its massive lineup of PCs and notebooks with Intel's new Skylake processor, Lenovo is also introducing three new Android slates under its Yoga brand at IFA 2015. Now in its third generation, the Yoga Tab 3 is designed to keep you entertained, and Lenovo packs in features such as enhanced audio, better multitasking and even a rotating camera into a slim, sleek body. There flagship tablet of the Yoga Tab 3 series is the Yoga Tab 3 Pro. Other tablets in the line include an 8- and 10-inch Yoga Tab 3 model. All Yoga Tab 3 tablets come with Lenovo's barrel design, innovative flip-out kickstand, and gesture control. 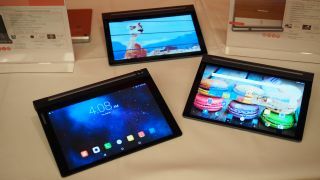 Lenovo claims that it has toned down the software customization on its Android tablet and reduced the bloatware, offering as close to a native Google experience as possible. This is a result from the lessons the company learned when it acquired Motorola Mobility, which has retained a vanilla build of Android on its phones, save for a few useful customizations. Even though the Yoga Tab 3 Pro ($499, £325, AU$709) shares the same 10-inch screen size as the regular 10-inch Yoga Tab 3, the Pro model has a slightly smaller footprint overall, making it more compact. The Pro model is all about consuming and enjoying content. It packs in a small pico projector that can project the screen on a wall up to 70 inches wide. If you want more privacy to view your videos and photos, the 10.1-inch display has a QHD resolution of 2,560 x 1,600 pixels. Audiophiles will enjoy the four front-facing speakers that are tuned with Woldson Master Hi-Fi technology. The speakers are located in the barrel, in a design that Lenovo calls a sound bar. Speakers are built by JBL, and Lenovo claims that you'll get a virtualized Dolby Atmos 3D sound experience, a first for tablets. For multitaskers who like to stay productive, Lenovo loaded up the Yoga Tab 3 Pro with a Smart Window 2.0 functionality so you can open multiple apps at the same time, each in their own window. The Pro model is constructed with a metal frame and comes with a leather-like backing. When we reviewed Lenovo's Windows-based Yoga Tablet 2 with AnyPen technology, we criticized the slate's high asking price for the special screen tech. Fortunately, the 8-inch ($169, £110, AU$240) and 10-inch ($199, £129, AU$283) Yoga Tab 3 slates don't have the same premium issue. Still, these tablets allow you to have the precision of a stylus by using any metal object to write on your HD screen with the built-in AnyPen tech. This means you don't have to invest in an expensive stylus that you'll likely misplace over time, but it also means if you choose a sharp metal object, like a knife, you could end up scratching your screen. These tablets come with a rotating camera located on the barrel. This way, you'll have the same camera to take pictures of the world or yourself. The camera can be activated with gesture controls, Lenovo said in a statement. You can use the kickstand to prop your tablet up, open your hand and close it into a first to capture a photo. Unlike the Pro edition's quad-speaker arrangement, the barrel houses stereo speakers for Dolby Atmos sound. To round out the entertainment focus, Lenovo is pre-loading these tablets with the Netflix app so you can start your binge-watching experience as soon as you open the box. Lenovo isn't quoting specific battery life numbers, but the company claims that these tablets contain some of the largest batteries available in the tablet market. The third generation Yoga Tabs also look sleeker. The soft touch, black back feels nice to touch and doesn't seem to attract fingerprints or oils, and the kickstand is now activated with a push button mechanism rather than requiring users to pull down to engage. Additionally, the stand has a built-in opening to allow you to hang or mount the tablet, which is great for watching videos in the kitchen while cooking.